In the Spring of 1828, a young Abraham Lincoln took a 1,200-mile voyage down the Mississippi and Ohio Rivers. In the final landing of the trip, he stepped off his flatboat into the bustling city of New Orleans: a cosmopolitan port city, the wealthiest and most culturally diverse in the South. What was life like in New Orleans in the 1820s and 1830s? What did Lincoln experience on his two journeys to New Orleans? What may he have done while in the city? 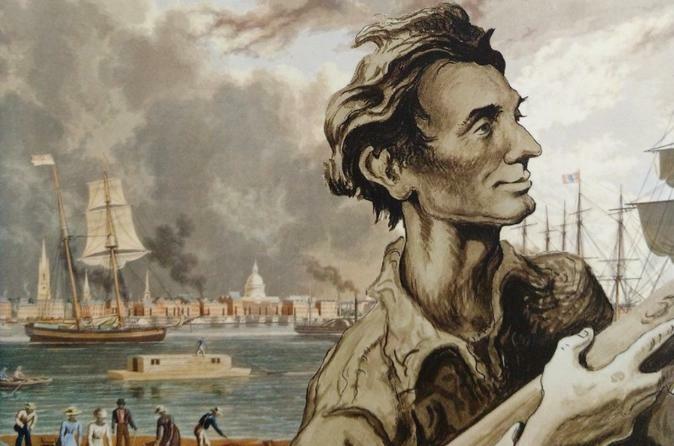 This tour explores Lincoln's journeys and the complex world of Antebellum New Orleans, with a range of topics from steamboats to streetcars, the slave-trade to slave-attacks, and how a Francophone city became increasingly Americanized. The Lincoln in New Orleans two-hour walking tour is offered on extended weekends, Friday - Tuesday, 9 a.m. - 12 noon. Special arrangements can be made for other times in advance. This walking tour is one-mile long and will go through New Orleans' historic Faubourg St. Mary, today's Central Business District and the French Quarter. Based on the scholarly study, "Lincoln in New Orleans: The 1828-1831 Flatboat Voyages and Their Place in History," by local geographer Richard Campanella, the tour introduction will provide a historical context of Abraham Lincoln's flatboat voyages down the Mississippi River to New Orleans, and how New Orleans became of a mecca of port-trade after the Louisiana Purchase. As the tour continues, we will explore the American architecture of Faubourg St. Mary while discussing Kaintucks, saloons, and what Lincoln may have seen in this part of town. As we approach Canal Street we will reflect on how this Anglophone suburb encapsulated cultural differences from its Francophone counterpart, the Vieux Carre. In the French Quarter, we will discuss New Orleans' Antebellum slave trade, Newspaper Row, and Hewlitt's Exchange--likely points of interest to Lincoln. The tour ends on the Mississippi River, right by the Steamboat Natchez. A discussion of the emerging transportation industry will conclude Lincoln's journeys while providing a panoramic view of the historic cityscape from St. Mary to the Vieux Carre.